Just over a week ago, the 2011 Linux Security Summit was held in Santa Rosa CA, co-located with Linux Plumbers. It ran for a day, starting with refereed presentations, and then round-table discussions. The SE Android talk was a last minute replacement for Ryan Ware’s talk on MeeGo (Ryan was unfortunately not able to make it). See the write-ups by by Paul Moore and LWN. Feedback so far has been positive. I think it’s valuable for the security developers to get together like this, after spending the rest of the year working remotely with each other. Next year, we’ll likely be looking at co-locating with LPC/KS/LinuxCon in San Diego. It may be worth thinking about expanding to a two-day event, with the first day following the same format, but then splitting into project groups on day two for BoFs/hack sessions. Contact the program committee if you have any suggestions. I’d like to thank the LPC folk, and especially Jesse Barnes, for allowing us to co-locate and taking care of all of the logistics — all we had to do was organize the talks and turn up. Also thanks to the speakers, discussion leaders and attendees. See you next year! This entry was posted in foss, Linux and tagged california, conference, events, foss, kernel, Linux, linuxplumbersconference, lpc, lpc2011, lsm, lss2011, santa rosa, security, selinux, smack, tomoyo ima evm crypto, usa on September 20, 2011 by jamesm. Many thanks to the folk at LF and the LPC organizers, especially Niv (also for the HTML listing above). If you attended LPC, or make use of the videos or slide, please drop by this thread at LWN to say thanks. If you have any suggestions for improvements, feel very free to volunteer your time at the next event. This entry was posted in foss, Linux and tagged conference, crypto cryptography, events, foss, Linux, linuxplumbersconference, lpc, lpc09, portland, sandbox, security, selinux, usa, xace on October 12, 2009 by jamesm. Last week was a busy one in Portland, starting with the SELinux Developer Summit on Sunday the 20th, followed by LinuxCon proper, and the Linux Plumbers Conference. The SELinux event went very smoothly, with around twenty-five attendees from the core SELinux developer community. Given tight travel budgets all-round, this level of attendance was very good to see. I’d like to thank Angela Brown, Craig Ross and the rest of the Linux Foundation team for making everything work perfectly for us (this was a co-located event ahead of LinuxCon). The day was divided into two sessions: standard presentations in the morning, followed by a more open general session in the afternoon. It was good to catch up on the latest development work and directions in the project, and also to bring the otherwise globally distributed team together in the same place. The inaugural LinuxCon then ran for three days, with an expansive programme. I gave a talk on adding extended attribute support to Linux NFSv3 — the slides for which may be downloaded as PDF or viewed on slideshare. I completed the initial code on the flight to the US and posted it from the hotel. Feedback so far has been positive, although I haven’t heard from the NFS maintainers yet (who are likely busy with the merge window). The rationale and technical approach is similar the NFSv3 ACL support which was merged some time ago; and the implementation is based on a fielded IRIX version (released under the GPL) — both factors which I hope will help with upstream acceptance. Also at LinuxCon: Dan Walsh gave a talk on sVirt, which I introduced earlier this year at LCA (and previewed of during a lightning talk last year at FOSS.MY). It seems to have been well-received (see LWN coverage), and it’s a good example of the high-level security abstractions which we can build once we have the underlying mechanisms in place. In the case of sVirt, where we apply strong mandatory isolation to process-based virtualization (e.g. SELinux+KVM), there is zero configuration — it configures itself automatically depending on which security model you have enabled. It should work with any label security scheme, such as Smack, and I’ve also heard that the AppArmor folk have it working (even though sVirt was not explicitly designed for pathname security). 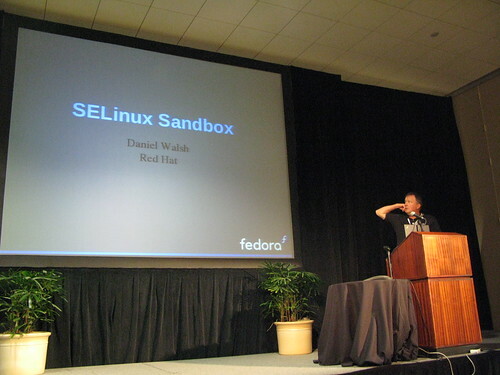 Dan gave a LinuxCon lightning talk at Linux on yet another high-level security feature: Sandbox X, which extends the SELinux sandbox mechanism to the desktop by running applications in isolated X servers via Xephyr. He gave a full talk on this the Linux Plumbers Conference, slides of which may be found here. I don’t have the time to cover everything at LinuxCon — check the web site for videos and slides. Also see my flickr photo set. It was a very impressive first conference, with LCA-quality social events and catering (Angela Brown has been quietly studying LCA, in fact) and certainly sets a new standard for such events in North America. 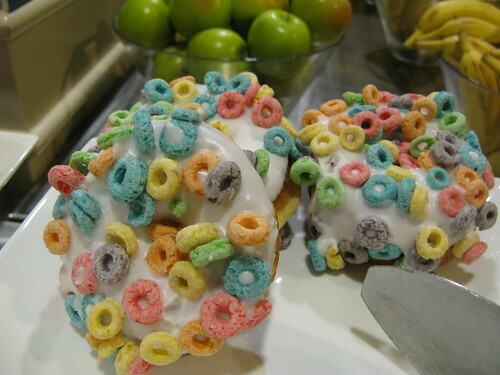 LinuxCon will be held in Boston next year — I wonder what they’ll come up with to beat bacon-maple donuts for breakfast. Following LinuxCon, the second Linux Plumbers Conference was held, and we were fortunate to get a double session for the security microconf (a special thanks to Nivedita Singhvi and team for making this possible). We had talks on several Linux security projects, including Herbert Xu with an update on the kernel crypto API, Caleb Case on SELinux in Ubuntu, David Safford on IMA, and Casey Schaufler on the Smack application ecosystem (some high-end televisions will soon be shipping with Smack, to isolate the applications of competing content providers). The XACE talk was very interesting, as we’re getting close to having workable support for MAC security inside X, which will allow the desktop to be locked down with fine-grained and comprehensive controls. While typically envisaged for MLS use (e.g. having “secret” and “unclassified” desktop applications running on the same system), there are also many general purpose scenarios, such as separating your online banking session from your IRC chats. It will be interesting to see what’s possible when combining XACE window labeling with Sandbox X — stay tuned. Slides from the LPC microconf will be at the event web site soon, and I’ve also made all them available for download here. It was a fairly intense week — three conferences plus the travel to and from Sydney, as well as the merge window opening a few days before. I’ve got a few weeks to recover and then it’s Japan for the Kernel Summit and Japan Linux Symposium, stopping in Kuala Lumpur on the way back for FOSS.MY (where I’ll be covering the latest in SELinux Sandboxing). Note that you can now follow my micro-updates on twitter, which is bridged from my identi.ca account. This entry was posted in foss, Linux and tagged events, Linux, linuxcon, linuxcon09, linuxplumbersconference, lpc, lpc09, oregon, portland, sandbox, security, selinux, selinuxdevelopersummit, smack, usa, xace on September 29, 2009 by jamesm. We’ve just published the schedule for this year’s SELinux Developer Summit. This year's event will be divided into two main sessions. 20-minutes of presenting and 10-minutes of Q&A. collaborative in that everyone in attendance may (and should) participate. talk via the wiki or on the day. advantage of the fact that we're all in the same place for the day. everyone is set up to get straight to work on the day. finalized immediately prior to the event. Summit. The current discounted registration rate ends on August 15th. The development sessions idea comes from last year’s development-oriented FOSS.IN, which I wrote about here. If you’re still considering whether to attend the SELinux Developer Summit, keep in mind that in addition to being part of LinuxCon, there’s also Linux Plumbers directly following that at the same venue, which includes a general Linux security microconf. Travel budgets are tight for everyone this year, so hopefully the co-location of these events will help make a business case for people who are still working on travel approval. For those who can’t make it, we’ll try and ensure that all available materials and minutes from the event are published in a timely manner. I’d encourage those who are able to attend to blog/dent/tweet anything related to the event that they feel might be useful to others. 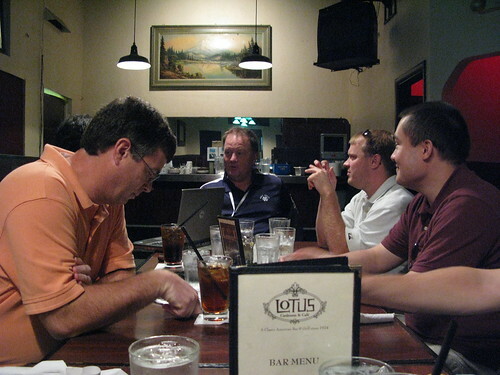 This entry was posted in Linux and tagged events, foss.in, Linux, linuxcon, linuxfoundation, lpc, portland, sds09, security, selinux on July 24, 2009 by jamesm.